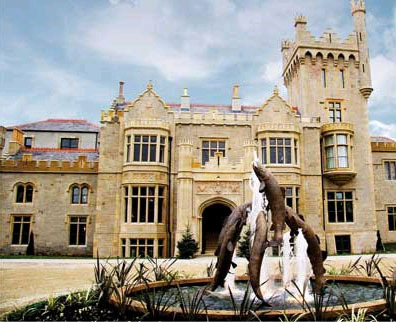 Escape to the mystical realm of Solis Lough Eske Castle. As the first and only five-star Donegal Ireland hotel and spa, this stirring destination blends a rich sense of history with superbly appointed accommodation and impeccable hospitality. Dating back to the 1400’s, this meticulously restored Donegal Ireland hotel is nestled in an enchanting forest of massive, ancient trees, where the Celtic language still rolls off the locals’ tongues and the landscape maintains its pristine unspoiled beauty. Discover the unique aura of this five-star Ireland hotel – a truly extraordinary setting for vacations, corporate retreats, and social gatherings. Tucked within the captivating woodlands of Northwest Ireland, Solis Lough Eske Castle offers luxurious accommodation, stunningly set in a meticulously restored 17th Century castle. Featuring just 98 guest suites and a luxuriant spa, this secluded hideaway beckons you to leave civilization behind in exquisite style. Each guestroom at the Solis Lough Eske Castle blends the timeless allure of our Gaelic heritage with the amenities and conveniences of a modern world-class hotel. These beautifully appointed rooms feature bespoke furnishings and specially commissioned works of art, spacious bathrooms and high speed wireless internet. Many include antiques and 4-poster beds. All are decorated in calm neutral tones and offer striking views of the natural beauty that surrounds the castle. Accommodation range from the contemporary stylishness of our Garden Suites…to the country charm of our converted stables…to the more traditional elegance of our Castle Suites with their leaded windows, exquisite antiques and private access to the castle tower. Lough Eske Castle traces its roots all the way back to the late 1400’s and the famous O’Donnell family that founded the nearby town of Donegal. The original castle was first built around 1474. A date stone of 1621 remains on the property to this day. The current Lough Eske Castle was constructed in the 1860s on the site of an old Brooke mansion, but was destroyed by fire in 1939. The newly renovated Lough Eske Castle stands as a continuing testament to the rich history of Lough Eske and the surrounding region. Situated in the castle garden, the setting is refreshing and peaceful. Its beautiful sandstone and rich wood floors reflect the natural beauty of the sylvan surroundings. Your experience here is made complete by our skillful staff. Spa Solis features four single treatment rooms, two couple suites, one pedicure/manicure room and a thermal suite with hot benches, steam sauna, luxury showers and more. The relaxation area is equipped with six designer beds that face into the courtyard. We also provide spacious men’s and women’s locker rooms. You can work out in our fully equipped fitness center. It includes high-tech treadmills, exercise bikes and other equipment. We also invite you to take a dip in our spacious 12m indoor swimming pool with its beautiful glass atrium. Whether your wedding is an intimate family affair or a grand celebration for up to 220 guests, every detail from the music to the menu will be carefully coordinated by our chef and our wedding coordinator. When the day arrives, we will have checked and rechecked every flower, every ribbon, every detail. With exceptional service and gourmet cuisine, we will do whatever it takes to make your day a dream come true. Your wedding will be the highlight of a memorable weekend getaway for everyone. There can be a spa day for your bridesmaids. Golfing for the groomsmen. Surfing. Fishing. Woodland walks. Romantic dinners. Our attentive staff and fine amenities will ensure you and your guests the utmost comfort during your special celebration.